On this lazy (and scorching hot) Friday, I’ve been in the mood for the magical, meditative sounds of what is sometimes called “desert blues” – that strange, gorgeous, Sahara-nomads-with-electric-guitars music that was first made famous by a band called Tinariwen. Tinariwen are Tuareg musicians, and as such sing primarily in a Berber language known as Tamasheq (or just Tuareg). Berber languages are classified as Afro-Asiatic, just like Arabic, so if you think you hear a little similarity you might just be right. It might also explain why I find these words so enchanting. NPR recently featured Tinariwen on one of their Tiny Desk Concerts, playing a quieter acoustic set. Please enjoy these twenty minutes of polyglossic Friday hypnosis. P.S. I featured another desert blues-y band, Toumast, in my Polyglossic Playlist. If you enjoy this music, check them out too! On Monday night I had the pleasure of getting to see a screening of a movie called The Island President, which was followed by a Q&A with (former) President Mohamed Nasheed himself. As the movie follows President Nasheed around the islands of the Maldives, he discusses politics, democracy, and the effects of climate change with his constituents, conversing in a native tongue peppered with English and sometimes Arabic words. Do you know what language they speak in the Maldives? Neither did I! The people of the Maldives speak a language called Dhivehi (or just “Maldivian”), which is an Indo-Aryan language closely related to the Sinhala language of Sri Lanka. Dhivehi is written in its own alphabet, called Thaana. In the documentary, President Nasheed joins with a group of presidents of other small island nations who are similarly concerned about the future of their countries in the face of rising sea levels. The UN recognizes these as a distinct group known as the Small Island Developing States. I know so very little about these countries (where the heck are the Comoros?) and it’s a real shame. So in honor of the film, today’s pop quiz is about the languages of the small island nations! 1. What is the official language of the Comoros? 2. English and Gilbertese are the official languages of which island nation? 3. Creoles are spoken on which of these islands? 5. Portugese is the official language of which of these island nations? 6. Which of these is not a Polynesian language? 7. Which island language is actually a “set of Swahili dialects” according to wikipedia? 8. Which island nation has the highest number of unique languages? EXTRA CREDIT: True or false – Tok Pisin, the official language of Papua New Guinea, is a pidgin. Answers: 1. a) all of the above! 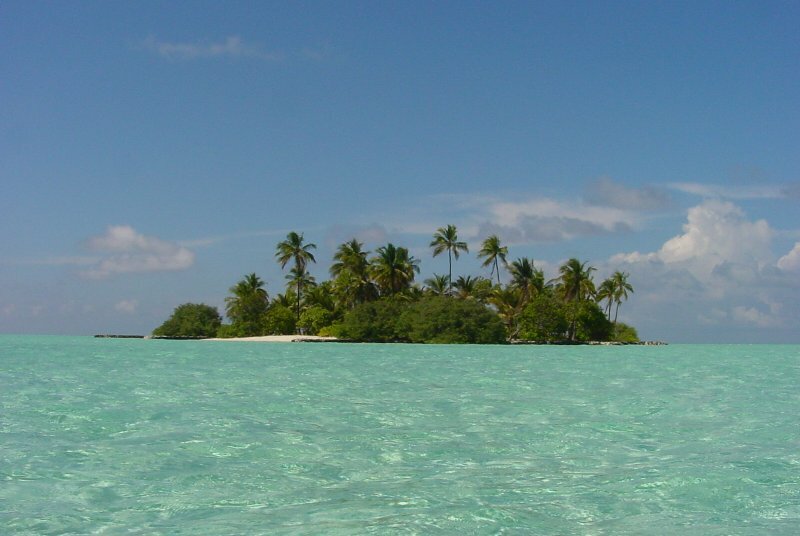 ; 2. c) Kiribati (the name comes from the local rendering of the English term “Gilbert Islands”); 3. d) all of the above! ; 4. b) Maori; 5. a) Cape Verde; 6. d) Palauan; 7. a) Comorian; 8. b) Papua New Guinea – with an eye-popping 830 living languages at last count. Extra credit: False. The “pisin” in the term probably did come from the word “pidgin”, as the language almost certainly started as a pidgin among the speakers of the hundreds of Papuan languages, but it has since developed into a fully-fledged creole language. This was a tough one! I hope you learned something new – I sure did while researching for this quiz. The Maldives, along with all of the islands featured in this quiz, belong to an organization called the Alliance of Small Island States. Please check out their website to learn more about the issues these nations face and the important work they are doing together. The “this” they’re referring to is a new website called the Endangered Languages Project. The project was launched by Google, and since they announced the launch last week on their blog, the story has been picked up by Time, CNN, the Economist, and countless other large and local publications. Holy smokes, that’s a lot of media attention for this issue! You really should check out the website. Obviously the media attention is great, as so many people are simply uninformed about the crisis of language loss. But even beyond that, the website is informative, collaborative, and thorough, with plenty of room for playing and exploring (if you’re just curious) and even more room for adding and improving (if you’re an expert). The site was developed through collaboration of members of the Alliance for Linguistic Diversity, which includes the Living Tongues Institute for Endangered Languages, whose work on Koro is featured on the front page. To see a list of members of the Alliance and the Advisory Committee you can scroll down about halfway on the site’s About page. It’s a really impressive and inspirational team they’ve put together. The Modern Language Association of America is probably best known for their style guidelines used by many scholars and student researchers. The MLA is also a professional organization for teachers and scholars of languages and literature. (In case you’re wondering, the “modern” in the term refers to the fact that association was specifically founded to capture all of the languages other than the classics – Greek and Latin – that were prevalent in academia at the time of its founding in 1883). Last week, the MLA issued a Statement on Language Learning and United States National Policy. It is a carefully worded, sensitive but assertive defense of foreign language education in the US, and it is definitely worth a read. Obviously this is an issue dear to my heart, so I applaud this official stance. What I find most personally inspirational, though, is the rationale laid out in the statement. Yes, mastery of foreign languages is important for economic, political, and national security reasons, the MLA acknowledges. But beyond that, the association stresses that “such learning serves as a portal to the literatures, cultures, historical perspectives, and human experiences that constitute the human record.” The value of learning languages is not just pragmatic, but personal (a view I very much agree with). The statement also points to the wide variety of heritage languages spoken within the US, and to the fact that research demonstrates the unique cognitive benefits of learning a second (or third or fourth) language, among other reasons that sound language education is important for Americans. I think that, much like the Hitchhiker’s Guide to the Galaxy, every single language textbook should have this helpful piece of advice emblazoned on its cover. I really, really love learning languages, but even I have my moments where I see my own reaction reflected in the bewildered, flushed faces of my classmates. Everything is going along swimmingly and then you learn one piece of information and suddenly you get that feeling like the room is getting dimmer and you’re not breathing properly. Russian has how many noun cases? French has how many irregular verbs? I have to what?? I was not deluded that this language was going to be a piece of cake. (None of them are!) But there’s a reason language teachers just try to get you to put one foot in front of the other instead of letting you see the whole map. If you knew all of the mountains, ravines, and miles and miles and miles of slogging you had between you and that magic fluency finish line, you’d probably give up before you started. So being the kind of language learner who just needs to have the map can be detrimental to one’s mental well-being. In the bitter struggle that was my brief encounter with Sanskrit, I learned one very important skill: the skill of letting a language wash over you. I learned to stop fighting it, to stop asking why? ?, to stop tearing my hair out wishing it were simpler. When we were introduced to something new in Sanskrit grammar, I would half-close my eyes and imagine myself as a strong young tree in the middle of a flowing river. The river comes and comes and I just let it keep flowing, catching as much of it as I could, not struggling to dam the stream. Yes, Sanskrit taught me linguistic meditation. So instead of losing my nerve over Arabic verbs, I took a deep breath and said “Okay.” Out loud. Then I closed my computer and turned to my bookshelf, lazily pulling down a book of verb paradigms in Classical Greek just to thumb through. And then I remembered…oh yeah! I’ve done this before! No language, no matter how many verb forms (and, goodness, Greek has a lot) has killed me yet, and I’m not planning to let any new one do me in. I just have to remember my own advice. I would like to talk to you about Eurovision. If you live in Europe, obviously you don’t need to hear me talk about Eurovision. If you don’t, Eurovision is a song contest held annually with representatives from, as of last count, 42 countries. Each of the countries hold their own domestic competitions to determine who they will send to the contest, and each of the participating countries get to vote on their favorite of their competitors, which is how the winner is determined. Despite the diversity of nations represented, I’m sorry to say that Eurovision isn’t usually the festival of linguistic diversity I would like it to be. Most entrants sing in English; this is a pop contest after all, and you’re trying to appeal to as broad an audience as possible. When I watched the show from my host mother’s kitchen in St. Petersburg, I specifically noted every entrant who purposefully sang in their native languages – all three of them, if memory serves. And no, Russia was not one of them. This year, however, Russia didn’t send their usual pop starlet or dreamy dark-haired pop hunk. Instead, they sent six grandmothers from a rural village. And they came in second! In all of Europe! No offense to the winner from Sweden, but Buranovskiye Babushki are probably my favorite thing I’ve ever seen on a Eurovision stage. From their traditional garb to the sight of an 80-year-old woman telling me it’s time to party, they take the cake. And yes I tend to root for the Russians any way, but I swear it’s not just that. Plus they’re singing in their native language of Udmurt! Plus they’re donating all of their concert profits to rebuilding their village church which was destroyed under Stalin! If the point of Eurovision is to put your country’s best foot forward, I think Russia really nailed it this year. While the mechanics of language policy can be pretty academic, actually implementing such a policy tends to get, as you can see, fairly heated. This photo is from a few weeks ago when the Ukrainian parliament was debating a bill that would recognize Russian as a co-official regional languages in areas of Ukraine with high populations of Russian speakers. While some commentators call for cooler heads, stressing that the bill keeps Ukrainian as the one official state language for the entire nation, and proponents say that it is merely a step towards offering language services to all linguistic minority communities, opposition parliamentarians and activists have staged protests in Kiev and all across Europe, claiming the bill is a threat to the Ukrainian language and a move by powerful players to bring the nation even more under the sway of Russia itself. Tensions ran so high that parliament had to shut down after a fistfight broke out in the middle of deliberations. I’ll refrain from taking sides in this one. I have a degree in Eastern European and Russian studies, and obviously I also have an interest in languages and language policy, so I can see things from both sides. Which is why I’ve been avoiding discussing it 🙂 But I wanted to bring it up to show just how tangled and tangible official policies about languages can be. Ukraine’s politics are complicated, but so are politics everywhere, and it’s usually safe to assume that policies often have to do with factors outside of the policies themselves. Language policies are almost always closely connected to issues of power, inequality, and disenfranchisement (or hegemony). And of course, our languages are very close to our hearts, a fact made even more apparent when we perceive them to be under threat. Ukrainian expats in Europe protested holding signs which read “Language lives – Ukraine will live!” Language policy, like language itself, touches on identity, community, family, power, history, all of those intensely human and intensely emotional things. But this doesn’t mean, of course, that these kinds of things always have to end up in a fistfight. Al-Jazeera today reported that Turkey has announced it will lift a ban on teaching Kurdish language in Turkish schools, a policy step taken in the hopes of reconciling with the large Kurdish minority within that country. It’s a small step, and many Kurdish activists underscored that it doesn’t go far enough in addressing all of the problems between the majority and minorities in Turkey. But it is an important step, and an interesting one. And as the Ukrainians would remind us: language policy matters quite a lot. Sometimes we can use certain terms with such frequency that we never stop to define them clearly. Sometimes we assume that we all agree on the meaning of a term, so we never really examine that meaning together. One of the most interesting things to me about my first year of my master’s degree is how frequently I have been forced to pause and ask myself, “What is language?” In several cases my textbooks authors or scholars I’m reading seem to be using the term in a way that is broader, or narrower, or sort of just to one side of how I would think of it. One of my textbooks, for example, took into consideration such categories as body language, dress style, even physical touch and proxemics (conventions for acceptable physical distance between two people). Is that language? I’m still pondering that one. Of course, dictionary definitions abound. H. Douglas Brown defines it as “a systematic means of communicating ideas or feelings by the use of conventionalized signs, sounds, gestures, or marks having understood meanings.” A common introductory linguistics textbook tells us that “language is often viewed as a vehicle of thought, a system of expression that mediates the transfer of thought from one person to another. “ These sound like pretty straightforward definitions, until you start to unpack them. That first definition says language communicates ideas or feelings, but what about information, questions, curses and blessings? The second one says that language is a means of transferring thought from one person to another; so when you say a prayer to a higher being or discuss the bad day you had with your dog, is that not language? I love that quote. It encapsulates everything I love about language, and why I think languages are important. It captures that specifically human, collaborative, and monumental quality that is unique to language, however you want to define it. And I love that Emerson acknowledges that it is something to which we all bring a stone, not just the masons and the architects, the master builders or, in this case, the linguists. Not just the speakers of global powerhouses like English, but the speakers of every single language. It is a city which we are all constructing together, and it is a city whose construction will never be finished. So I wanted to ask you, dear readers: what is language? You don’t have to give me a scientific definition, though you’re welcome to of course. I know some of you are linguists, armchair or otherwise, but I want to know what everyone thinks. Do you have a quote that you like? A feeling you’d like to share? Brown, H. D. (2007). Principles of language learning and teaching. (5th ed.). White Plains, NY: Pearson. Finnegan, E. (2008). Language: Its structure and use. (5th ed.) USA: Thomas Wadsworth. It probably wouldn’t surprise you if I confessed that I love languages. I can read about and talk about and think about languages forever; I’ve spent so many hours of my life transfixed to a wikipedia page describing the morphology of [insert name of language here] that it’s a little embarrassing. But that nerdy kind of love, the love that is really just a fascination with an intellectual object, sometimes gives way to full, helpless, head-over-heels love. I feel safe to finally admit that I sometimes fall in love with a language, because recently I came across the blog of august British linguist David Crystal, and he has a post describing this very phenomenon. It’s not just me! It’s a little thrilling to read someone I admire admit to “falling in love with nasalized vowels” in a French class as a child. It takes me back to the afternoon when I was seven or eight, sitting on the floor of my grandparents’ house, and I discovered their collection of old Berlitz textbooks. Seeing those foreign words dance across the page, knowing they said something but I couldn’t yet divine just what…I was enchanted. I’ve been enchanted ever since. Sometimes I do feel like I’m being a little fickle, picking up a new language every so often while the ones I’ve learned years ago slowly fade in my memory. But the truth is that those earlier ones don’t ever lose that affection. In my case, whenever I’m really struggling with a new language, I turn back to Russian, that oldest and best-known friend, for comfort. That’s how I think of it – just adding new, dear friends to your acquaintance. David Crystal says “it’s more like the love of a parent towards a child. Somehow, new additions to the linguistic family don’t diminish the affection already felt towards the other members.” That’s a good analogy too. So, having said that, please forgive me, dear old language friends, but I have lost my heart to a new love. Oh Arabic, where have you been all my life? I am such a beginner, I can barely read and say hello, but I really have fallen for this language. I love this post on the blog The Polyglot Dream, where the guest blogger talks about a language resonating with you. There really is something about the sounds of Arabic that resonate with me differently than others I’ve learned. I love what the guest blogger, Susanna, says: “Guttural sounds in Arabic and Hebrew make your throat vibrate differently than when you speak in English. Your body is not the same in Arabic as it is in English.” She also talks about “giving up your throat” to Arabic. I love that. Is that the sense I’m getting? Do I feel different with Arabic? I swear I thought I’d died and gone to heaven. In church yesterday the choir sang three pieces in an indigenous language of Taiwan called Atayal. Arrogantly assuming that if there were a language I hadn’t heard of it must be because it is critically endangered and no one else has heard of it either, I went home to see what the Ethnologue had to say. Turns out, Atayal is not classified as endangered and at last count had almost 85,000 speakers. It also turns out that I know/knew basically nothing about languages in Taiwan. The dominant language in Taiwan is, of course, Chinese (specifically Mandarin). But Taiwan is also home to a few hundred thousand of what the Ethnologue calls “tribal people,” and there are almost two dozen different languages, of varying sizes, spoken on the island. In fact, Taiwan is regarded as the origin of the entire Austronesian language family, which also includes Polynesian languages such as Maori and Hawaiian, southeast Asian languages such as Tagalog and Indonesian, and even Malagasy all the way over in Madagascar. All of this makes Taiwan very linguistically interesting indeed. While I’m a little ashamed of my initial arrogance and cluelessness, I absolutely love the fact that I still have so much to learn. I love that there are so many languages, in so many different places, spoken by so many different people. I love that there is always something new to discover. I hope we can maintain a world where there are still these kinds of discoveries to be made.